When building new Google Analytics queries, you are faced with picking from over 400 dimensions and metrics, not all of which work together. To make the selection process easier, the latest release of the Analytics Edge connectors for Google Analytics will give you a visual indicator of invalid selections (Free version available now, Pro version coming real soon – upgrade links below). 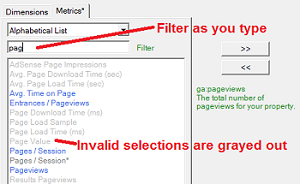 In the new wizard interface, as you add dimensions and metrics to your query, invalid selections will be grayed-out. You will also notice that I moved the Filter box above the list, and it now dynamically filters as you type, just like in the web interface. Deprecated fields (ones you should stop using) are also grayed out, but can still be used so your old reports will continue to work until Google drops them (note: Is Mobile and Is Tablet dimensions are about to be dropped!). I need to warn you that some combinations of dimensions and metrics may “work” when used in a query together, but that doesn’t mean they give you “valid” numbers. Make sure you check out my Misunderstood Metrics series (see below) that describes the most common examples.